I have another Femme Fatale cosmetics lacquer to share tonight. I wore this one about a week ago before I had that disagreement with my broken ring finger nail. 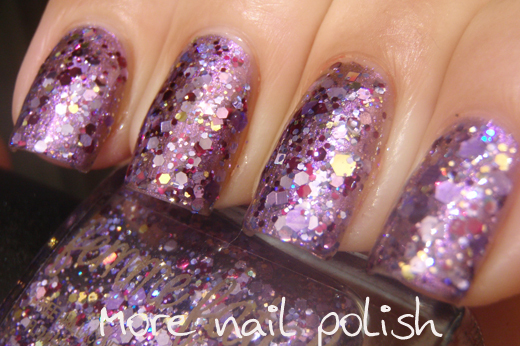 Lucent Ametrine has a clear base with various shades of purple glitter in a multitude of shapes, sizes and finishes. 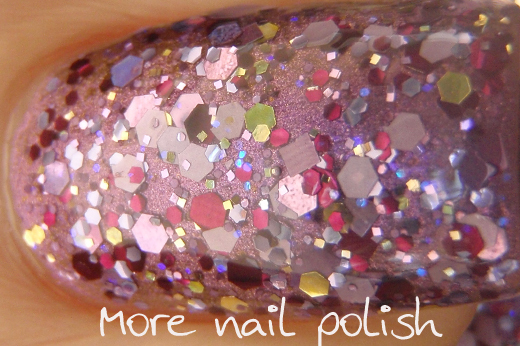 There are also darker wine coloured glitters, iridescent blue and hints of gold. Here I have one easy coat of Lucent Ametrine layered over Pretty Serious Atomic Brain. I used Br Big High Gloss Top Coat on top of this, which I've actually been using it quite a lot. I now have a decent dent in my 30ml bottle. I find it an excellent top coat, it dries fast, is super glossy and doesn't shrink. 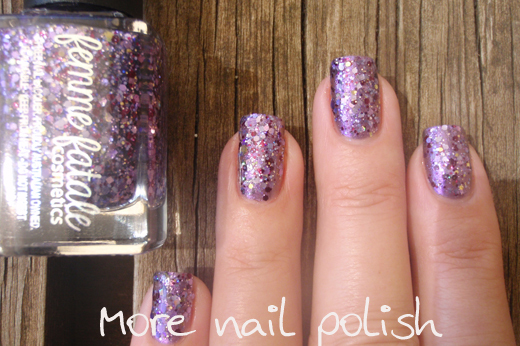 Femme Fatale Cosmetics polishes are available directly from her shop for Australians. For all you international ladies, Femme Fatale polishes are available in a bunch of places around the world now. Check the international stockists page for more info. Oh I love this one...wonder how it would look over a deep plum? I will definitely have to check out the International stockists! Lovely!!! Hope I can get one to Argentina!! !